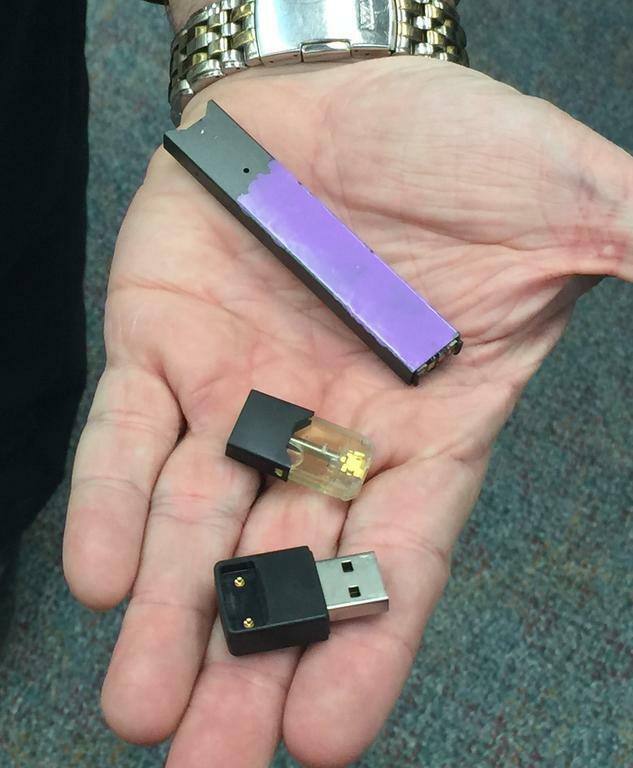 WESTBROOK — School and community leaders are putting a plan together to curb the use of electronic vaping devices as the trend becomes increasingly prevalent among teens. The School Committee is working on updating its drug and alcohol use policy to specifically include vaping, and like existing policies for alcohol, drug and tobacco use, it will include both a punitive penalty per infraction and steps for remediation. The School Committee’s policy is committee is reviewing the updates now, and the new policy could go before the full board for approval in March, said Superintendent Peter Lancia said. The revised policy, he said, is going to be all inclusive. “It really involves everything, which it needs to. There is a deliberate focus in our response after and puts some well-defined supports in place like counseling and restorative actions,” Lancia said last week. Middle school Principal Laurie Wood said “the phenomenon is really pretty new” among students there, but the problem does exist. At the high school, vaping is “pervasive,” said Principal Kelli Deveaux. “It reaches across all demographics, and anecdotally we are seeing significant impacts on a child’s behavior and health,” Deveaux said. Vaping is the No. 1 substance use issue at all high schools and middle schools and all districts are dealing with it, according to Alexandra Hughes, director of Westbrook Communities that Care, a coalition working to prevent youth substance use. “I am in constant communication with other community coalitions across Cumberland County and the state. It’s become a focus of everyone’s work plans,” she said. Hughes’ goal is to raise awareness with parents, students and members of the community about the dangers of vaping. She has held forums this fall and winter at the high school and middle school. It’s attractiveness to teens, Hughes said, is the problem. “What is contributing to the popularity is this is the marketing to teenagers, the celebrities who are vaping and the need to have the latest technology,” she said. Electronic vaping devices, often called e-cigarettes, Juuls, vape pens, hookah pens or mods, are unregulated by the Federal Drug Administration and pose a risk to teenagers. Youths who experiment with electronic vaping devices are more likely to use cigarettes and develop a substance addiction, Hughes said. These devices, she said, contain greater amounts of nicotine than traditional cigarettes, which can affect students’ attention, learning and impulse control. Vaping devices can also be used with THC, a major component of marijuana. The 2017 Maine Integrated Youth Health Survey reported that more than 32 percent of high school students in Cumberland County said they had used an electronic vaping device, including almost 16 percent at least once in the 30 days before the survey was taken. The survey said 8.6 percent of middle school students had used an electronic vaping device, with 3.5 percent doing so in the last 30 days. Those figures were down from the previous year, but Hughes said she fears the numbers for 2019 will trend back up. Westbrook students were scheduled to take the 2019 Youth Health Survey this week. Those results will be available next year. Electronic vaping devices include from top to bottom, the vaporizer, cartridge and USB plug for charging the device’s battery.